Background: Matrix metalloproteinases (MMPs) are zinc-containing endopeptidases, proteins essential to the degradation of various tissue extracellular matrix proteins. Under normal conditions, MMPs participate in several physiological processes, both in the developing organism and the adult. Multiple sclerosis (MS) is an inflammatory demyelinating disease of the central nervous system (CNS), affecting primarily young adults. Inflammatory infiltrations of the CNS parenchyma by autoreactive immune cells, that mediate myelin degradation in the form of the demyelination “plaque”, are the pathological hallmark of the disease. Due to their capacity to orchestrate tissue penetration from various cells, MMPs have been elucidated in MS as mediators of blood-brain barrier disruption and CNS inflammation, thus contributing to the disease pathogenesis. 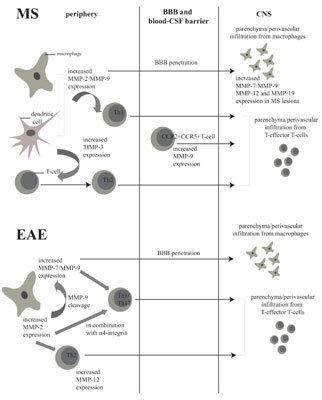 Objective: This review focuses on clinical and experimental evidence of MMPs' pathogenetic role in MS and its animal model, experimental autoimmune encephalomyelitis (EAE). Method: A MEDLINE search was performed for using the following terms: “metalloproteinases”, “multiple sclerosis”, “experimental autoimmune encephalomyelitis”, “central nervous system” and “autoimmunity”. Results: Expression patterns of MMPs and their specific inhibitor molecules at the sites of MS and EAE lesions, as well as by specific cell types of the immune system, provide evidence of MMPs' role in the pathogenesis of CNS autoimmunity. Clinical evidence suggests differential profile of MMPs’ expression in serum and cerebrospinal fluid (CSF) between MS patients with various disease types and healthy adults, rendering MMPs potential biomarkers for disease incidence and activity. Conclusion: MMPs' role in the processes of CNS inflammation, de- and remyelination, confers implications as therapeutic targets, either alone, or in relation with widely-used disease modifying treatments in MS.
Blood-brain barrier, cell migration, disease modifying treatment, experimental autoimmune encephalomyelitis, inflammation, Matrix metalloproreinases, multiple sclerosis, neurodegeneration.